A few years ago I discovered printable calendars and have collected various printable things on my computer ever since. This year I went to buy my usual Kikki-K wall planner only to realise that this year’s is a bit blah looking, plus we’re supposed to be avoiding buying things we don’t really need with the baby coming. 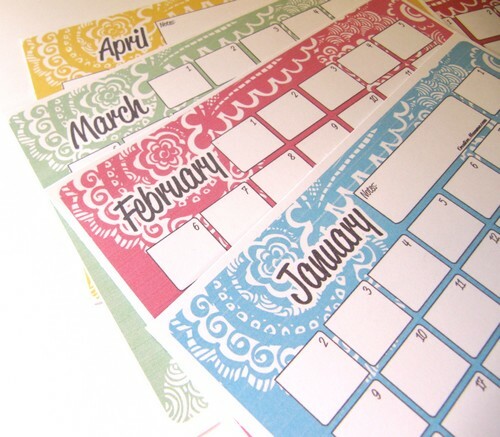 Luckily Skip to My Lou and Frugal Upstate have posted a list of free (or almost free) printable calendars for the year! Hooray! I chose the one pictured below which is a generous freebie from Creative Mamma. I can’t show you today how this is going to replace my trusty Kikki-K planner – it is bad luck to put a calendar up early- but all can be revealed on the 1st. ETA – talk about coincidence- a couple of hours after posting this I’ve just received and email from Toffee magazine with a link to their free printable calendar! You need to have bought a mag to get one though!